Hello. I’m a collage artist, live and work in the NY Metro area. I teach collage workshops for teens and adults. I love paper. I wrote My Life is About Glue. I want to get things to stick together and stay connected. An artist friend introduced me to collage 25 years ago. She showed me how she worked with ordinary magazine papers. I was smitten! Her image was so intriguing. The papers were so colorful. I tried collage and discovered I love paper. I love tearing, cutting, placing and gluing paper. It’s about the sense of TOUCH. Collage is also about serendipity and possibilities. I teach collage workshops at nearby museums and art centers. I want to share the joy of paper collage with everyone. My photo (above) was taken at the opening reception for “Contemporary Confrontations: Art 2009” at the Katonah Museum of Art (Katonah, NY), a tri-state (NY, NJ, CT) group show, juried by Nan Rosenthal, Senior Consultant for Modern and Contemporary Art at The Metropolitan Museum of Art, NY, NY (recently retired). My collage, titled “Quote,” was purchased and now hangs in a private collection in NY. Photo: Andy Wainwright. See my new paintings on panel, and works on paper (all painted paper collage) in a series titled METRO – all sitting on the floor, spread on the table, and hung on the wall in my studio (image below). Studio photo by Jacob Hutchings. My favorite paper is handmade paper. I want it soft, smooth, and supple with a foreign pedigree. Hand made papers are so beautiful – and also expensive. To save a little money, I create my own painted papers for each collage, working with palette knife and acrylics directly onto magazine pages like ArtForum, ArtNews, and Art in America. It feels good to recycle and repurpose magazines (after I read them). Often I paint around and over words. Sometimes I allow letters and words to peek through. Collage artists all have favorite papers they use. I always ask: Where do you get your papers? Do you make your own paper? I have made paper, but prefer to go to ﻿﻿NY Central Art Supply﻿﻿ in NYC and select from their vast inventory. My favorite papers are from India and Japan. If you enjoy reading my posts, I hope you will add your comments. My goal is to create information and interest in contemporary collage, to showcase the work of important collage artists, and promote collage exhibitions. I’ll write about the workshops I teach and show you images of collages created in the workshops (and images by great artists that inspired the workshops). If you are tempted, take one of my collage workshops, open to all levels, beginner to advanced. I say collage is user-friendly. At the workshops, some people like abstract art and work with textured, patterned and painted papers. Some people like to do portraits and use magazine papers. We discuss copyright issues and how to modify appropriated images. Two workshops I teach are inspired by the art of Romare Bearden (African-American 1911-1988), one of the greatest collage artists ever. I get a lot of positive feedback. One student wrote: I loved mixing the colors and media and aiming for interesting painted papers. I also liked starting to learn about acrylics and how to play in them. 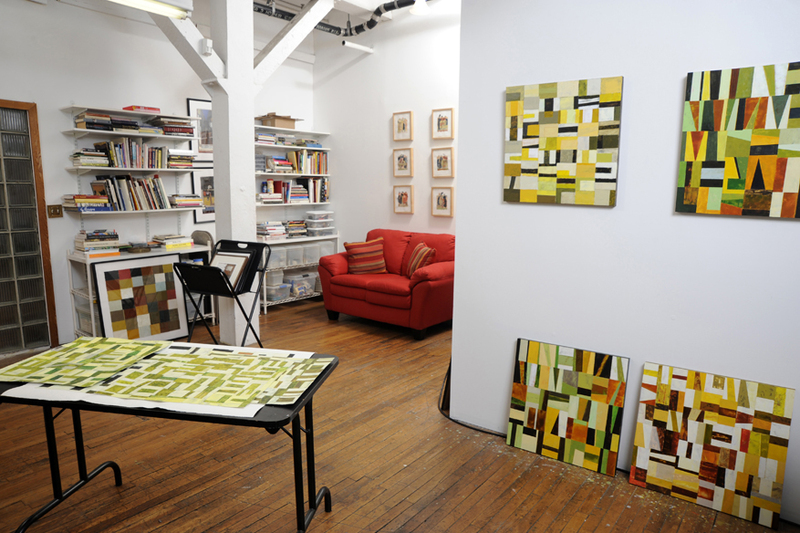 If you like colorful geometric abstraction (like the collage paintings you see in the studio photo nearby), please contact me, visit my studio and become a patron of my art. When I am not in my studio or teaching workshops, I’m at the computer. When I’m out and about, I like to see art with friends at galleries and museums, and there’s always time for coffee and conversation (whether with an artist or not). I am a member of the Silvermine Guild of Arts, The Society of Layerists in Multi-Media (SLMM), Studio Montclair Inc. (Montclair, NJ) and the New Rochelle Council on the Arts. I exhibit my collages nationally and internationally, and works are included in public, private, corporate and museum collections in the US, Europe, Japan, India and the Republic of Singapore. One of my favorite collage exhibits is an international exchange each April, organized by Dale Copeland. Over 100 artists participate (and exchange 13 small original works). One work from each artist is included in an on-line show and one work is exhibited in a brick and mortar gallery in NZ, and everyone gets a return packet with assorted works by the participating artists. If you make collage, I encourage you to participate. Get information and join the collage exchange. Enjoyed reading your blog… looking forward to your sharing about collage… Really benefitted from the info on the O’Keeffe Dove exhibit. I am really getting into O’Keeffe just now, but can totally see why you are more drawn to Dove. There is a familiarity / relationship — I think — between your work and his…. So glad you started your blog… Will add you to my blog roll so I can keep up. You talked about serendipity on a recent blog – you were traveling and looking for something and found something else wonderful as well! Bravo Serendipity. I enjoy reading your blogs. My next blog will be titled connections and talk about things I learned from students at 3 recent mini collage workshops that I led at the Newark Museum. I’m writing it now, and the blog is due out soon. I will add you to my blog roll also. Bravo to you. First time out, with WordPress too! Great job!! WordPress is user friendly. Thanks for the compliments on the Serendipity museums recommendation post. Sorry you’ve had tech problems and bugs with your blog. Rosalind: I finally wrote about connections and my workshops. I included comments on the narrative portrait workshop I just did for your class at Bloomfield College, with a link to your PAPERGIRL blog and 2 images from the students. The blog post is at: https://artofcollage.wordpress.com/2010/11/03/let-me-do-it-my-way/ – I think you have a great group of students at Bloomfield College. It was a pleasure to work with them. Impressive information sharing and community building, A real generosity of spirit. Do u do workshops in NYC? I am a beginner and am just tooling around with photos, paper scraps and construction paper. I don’t do workshops in NYC. I teach at the Pelham Art Center in Pelham. It’s a short train ride via Metro North from Grand Central Terminal and a quick walk from the train station. My classes are Monday nights and are open to all skill levels. Let me know if you are interested. 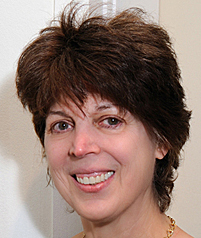 Hi Ann, I have a studio in New Rochelle and teach at the Pelham Art Center, both easy to reach by car or Metro North. Send me email: nancy@nikkal.com. Thanks.